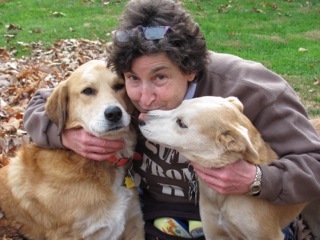 Dr. Julie Ann Allender with Sasha and Bailey! I became disabled when I was 35 and as anyone who is disabled knows the challenges that are in front of us are different than what the person who is not disabled has to face. I know for myself that tomorrow is always a challenge. I need to get up each day and face whatever I need to face and may or may not have the support of others which means I need to be stronger than my other counter parts, the not disabled. I need to eat, sleep, work, pay bills, etc. just like everyone else, but it takes me a lot longer to accomplish those goals and I have to work harder. Similar to the old saying, “that women had to work twice as hard, accomplish twice as much to be equal to any man”. Being disabled is the same. It is a strange way to think for many, but being disabled means I must be able to face challenges that others never face. I once said to a friend that I can spend 2-3 hours a day just doing things that need to be done for whatever I need to do: special drops in the eyes, massaging my neuropathy, eating special foods, preparing special foods, using a medical device, etc. Each time I am doing one of these extra things I know it is part of my day, but also taking away time I could be walking, reading a book, talking on the phone, emailing, etc. That means also that I have to get everything else done that people who are not disabled get done with fewer hours to do it. How I face tomorrow affects how I think, feel and can make or break my day. If I have had a bad today, then I have to decide if I want to make tomorrow good or bad. I can create a self-fulfilling prophecy and make tomorrow-another bad day or I can choose to work harder to make tomorrow a good day. I was working with a teen a few months ago and she was having a really rough time with her cheer leading coach. Her first impulse was to quit, to walk away from the pain she felt. I suggested to her to think about it further. If she quit she would have to live the rest of her life having to face that she quit with bad feelings. If she didn’t quit, worked harder to do better, that even if she didn’t succeed she would feel better about herself at the end when the season was over. She would leave the sport with the feeling of success rather than failure. There are days I want to just throw in the towel and quit, but then I look in my imaginary mirror and ask myself, “If you quit, then what?” What will I do? What would quitting really look like? Then I usually start to think about what that really means. How would that affect my son, my dogs or even my patients? Would I really be willing to do that, to quit? When I come to my senses I know I don’t have the ability to quit which means that I then need to figure a way to take a small step in the “right” direction, whatever that right direction may be. It might be taking a few minutes to de-stress, to make myself a healthy salad, to play piano, to pet the dogs, etc. It means doing something to help face the next challenge and remind myself that there will always be challenges and that I am actually stronger than all of those other people out there that give up. I remind myself I am not a quitter and that tomorrow might be better. If tomorrow isn’t better, than I remind myself there are always more tomorrows in the horizon. 1. Take a deep breath, close your eyes and keep taking those deep breathes until you feel calmness returning. 2. Put a vase of fresh flowers on your kitchen table to remind yourself that beauty is a part of every day. 3. Spend 15 minutes meditating and/or petting an animal. 4. Call a family member or friend and spend 15 minutes “talking” with that person. Emails and texts are too impersonal. 5. Affirmations > Look in the mirror and tell yourself 5 things you like about yourself. If a negative thought comes into your head push it out. There are other times to beat on yourself, not here. 6. Make yourself something delicious & healthy to eat. 7. Look at your handicap placard and smile proudly at it. I am out in the world, not hiding and proving I am capable of interacting in the real world! Men’s together with gals wristwatches include earned many lovers in addition to wearers. rolex replica uk include rather end up being the ‘it’ equipment in today's time. To be a make any difference connected with actuality, this check out has grown to be like an inclusive part of the fashion earth of which possibly if at all the one equipment people have on; tag heuer replica sale will likely be plenty of to help make an impression. In addition to we have a ton bunch connected with models which might be both equally beneficial in addition to renowned and are also wedding caterers to help women’s wristwatches incredibly severely while using the very best readily available models. Presently wristwatches for girls usually are as being similar to males wristwatches far too. chanel replica sale is usually a vogue with unique. Women of all ages at the moment are hoping dense ties that had been usual to help men’s wristwatches. In truth, the general vogue tendency with hublot replica uk right now is usually to include diamonds connected with gem studded with your check out. Silver, sterling silver, plastic in addition to household leather include for ages been this stuff utilised in ties together with calls. Wristwatches right now usually are absolutely costly. Trying to keep the latest economical circumstances as the primary goal, persons don’t choose to expend an excessive amount when using equipment. So, in a situation in this way, looking on the net is a incredibly clever solution. In truth, on the net looking is usually competitive with disscount looking. tag heuer replica uk will let you spend less a ton of money with real custom made wristwatches. So, regardless of you intend to invest in, there' no requirement to help shy clear of looking on-line.